Vladimir moved to Israel just three years ago from Russia and speaks only Russian. His only son was killed five years ago in a car accident, and he has no other living relatives. 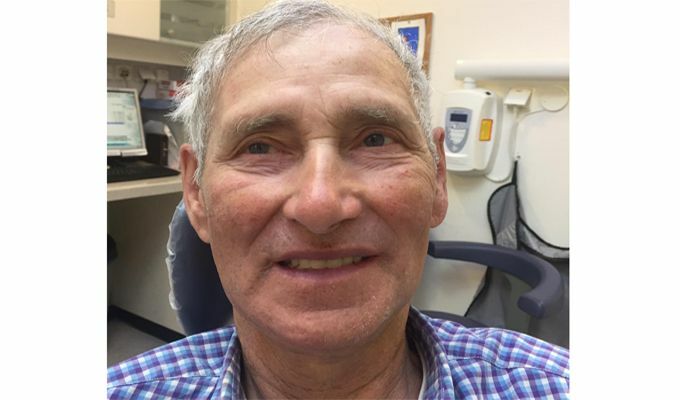 Dr. Lev, a dentist at the Yad Sarah Geriatric Dental Clinic, says Vladimir came in to the clinic after a lifetime of neglecting his teeth, and needed a long protocol of treatment. "We saw each other so often that he came to consider me as a member of his family," the dentist says. Each time Vladimir came for a treatment, he brought a photo album with him and showed the staff photos from the days when he was a young soldier in USSR army. "Vladimir's teeth were in such bad condition that he looked like he had none," Dr. Lev says. "Because he enjoys looking at photos, we decided to take 'before-and-after' photos of him. Today, after his treatments, he looks like a completely different person, and he is feeling much better about himself." The clinic's director, Dr. Michal Lederman, says Vladimir was absolutely thrilled with the results. He kissed her hand and told her (in Russian) that if she needs a handyman to do any kind of work around the clinic, he will volunteer to do it for free, in appreciation for the wonderful way in which he was treated at the clinic.